Videos of Hillary Clinton's alleged collapse are rapidly being deleted across the internet but two are posted below and hopefully they'll be seen by more people before they too are taken down by the great internet over-lords who will protect Hillary at all costs. 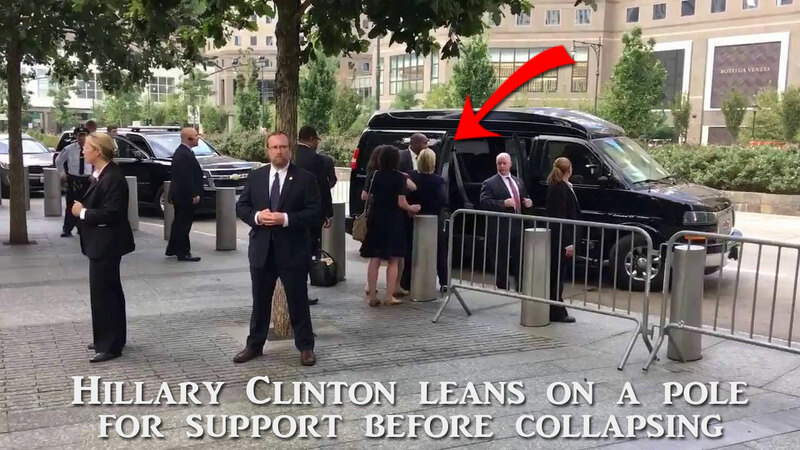 The videos reported show Clinton leaning against a pole as she leaves the event early—when a van arrives to pick her up she begins to noticeably wobble and then literally collapses as people swarm her (both to help her and shield her from cameras) and carry her into the waiting van. In one video you can see the soles of her shoes as she is dragged into the waiting van—meaning she could not even get to the door on her own feet. Her campaign has already begun to issue statements that she either was affected by the heat (she overheated in 80° degree weather at 9:30 in the morning) or that she was diagnosed with pneumonia on Friday and was being treated for it—but miraculously, as of Sunday afternoon, she now feels much better. Of course, both attempts to cover up another seeming health crisis can be debunked easily—as it was not a hot day in NY where the event was held—and no one recovers from pneumonia a few hours or days after treatment. The media was kept away—but there are at least three different angles of this scene shot by different people who were there. As many of those videos that can be found will be posted here—unless they are taken down by the Clinton campaign or her Masters.